On December 10th, the Chinese Embassy and Ministry of Health in Ghana jointly held a farewell and welcome reception for the seventh and eighth batch of China medical teams in Ghana. 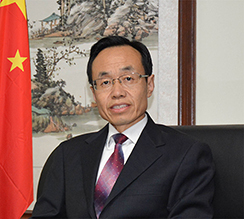 The Chinese Ambassador to Ghana, H.E. Shi Ting Wang, Minister of Health, Hon. Kwaku Agyeman-Manu, deputy Party Secretary of the First Affiliated Hospital of Guangzhou University of Traditional Chinese Medicine, Guo Wenhai, Superintendent of the China-Ghana Friendship Hospital, Dr. Juliana Ameh, representatives of the Guangdong Provincial Health Department, representatives of the seventh and eighth batch of China medical teams, officials from the Ministry of Health, and some diplomats from the Embassy, a total of more than 90 people attended the reception. Ambassador Wang briefly reviewed the cooperation between the two countries in the health sector since the first China medical team was dispatched to Ghana in 2009. Over the past ten years, the China medical teams have carried out 41,797 outpatient services and 3,093 surgeries and conducted free medical checks for local people in remote areas outside the capital city. The beneficiaries are numerous and the team have been widely praised by the Ghanaian government and the Ghanaian people. Ambassador Wang expressed his high affirmation of the hard work of the seventh batch of medical team, and extended a warm welcome to the eighth batch of medical team. He also thanked the Ghanaian Ministry of Health and the China-Ghana Friendship Hospital for their support to China-Ghana health cooperation and the Chinese medical team. Minister of Health, Hon. Kwaku Agyeman-Manu, in his speech, highly affirmed the outstanding achievements of the seventh batch of China medical team and said that he would actively facilitate the work and life of the new medical team members. Hon. Agyemang-Manu highly appreciated China's selfless help for Ghana's medical and health care and people's livelihood, and hoped to continue to strengthen exchanges and cooperation with the Chinese government in the health sector. Guo Wenhai, deputy Party Secretary of the First Affiliated Hospital of Guangzhou University of Traditional Chinese Medicine, introduced the relevant situation of Guangzhou University of Traditional Chinese Medicine and its affiliated hospitals, and encouraged new members of the medical team to work hard in the coming year to make greater contribution to China-Ghana health cooperation and China-Ghana friendship. Dr. Juliana Ameh, Superintendent of the China-Ghana Friendship Hospital, recalled with emotion the dribs and drabs of the work of the seventh batch of medical team. Being far away from their hometowns and families, the team members strived to overcome the difficulties of living in a foreign country, gave full play to their ingenuity and created conditions to carry out medical treatment and surgeries in the absence of basic medical equipment and facilities and won the respect of patients and hospital colleagues. The two team leaders also spoke on behalf of the members of the seventh and eighth batch of medical teams. Liu Chenglong, the team leader of the seventh batch of medical teams, introduced their work in Ghana and expressed their reluctance to leave Ghana. He also thanked the Chinese Embassy in Ghana, the Ghanaian Ministry of Health and the China-Ghana Friendship Hospital for their care and support for the medical team in the past year. Liu Qiuhong, captain of the eighth batch of medical team said on behalf of the eighth batch of medical teams that, the new team will inherit the fine style of the previous medical team and practice the spirit of the foreign aid medical team with work hard. Finally, Ambassador Shi Ting Wang and Hon. Kwaku Agyeman-Manu, the Ghanaian Minister of Health, presented certificate of appreciation to the members of the seventh batch of Chinese medical team.